Note : This article has also been published by bundesligafanatic.com. It was a late-published one, as real life got in the way both of me and Travis Timmons the editor. I’ve just submited it last Wednesday and just being published on Sunday night around 11 PM of Indonesia time, for the early-mentioned-reason. I know it’s kinda out of date, but instead letting it staying in harddisk till end of the days, Bundesliga Fanatic decided to publish it. So, I do it so. As they allowed me to post it on my blog, then here we go. On April 2015, Jurgen Klopp announced that his resignation would take time at the end of the 2014/2015 campaign. In respond to this situation, Borussia Dortmund moved quickly and appointed the exciting Thomas Tuchel as the replacement. The newly appointed manager was widely known through his nice journey with FSV Mainz 05 which the highest achievement was the 5th spot in 2010-2011 season. With all of his Mainz experience and playing style, Tuchel was believed to be the right man to continue the glorious days that has been “started” by Jurgen Klopp. Tuchel’s positional structure, ball circulation, and his high-up pressing would find its home at Signal Iduna Park. That’s what many thought on him. Is it right? Well, where Dortmund will end up after the 2015/2016 campaign will answer it. And Tuchel seemed to be convincing enough as he managed to give the very impressive first impression in his “first” Bundesliga match. On paper Dortmund lined up with 4-2-3-1, but, in fact, the shape was much more flexible as they developed and adapted the formation based on the playing phases. The basic and (one) crucial principle in Tuchel’s system is about positional-superiority which lead to numerical advantage, one that built the very compact shape of this Tuchel’s side. As aforementioned, Tuchel is a possession-based one. So, the circulation of the ball that intentionally to move the opponent to the desired area was one of most important element of his tactic. To support this strategy, he built his Dortmund with an aggressive positioning, which gave them fluid and dominant possession play. Three chain in deep build up. In their deep (1st phase) build up, Dortmund developed it by using their both central defenders. 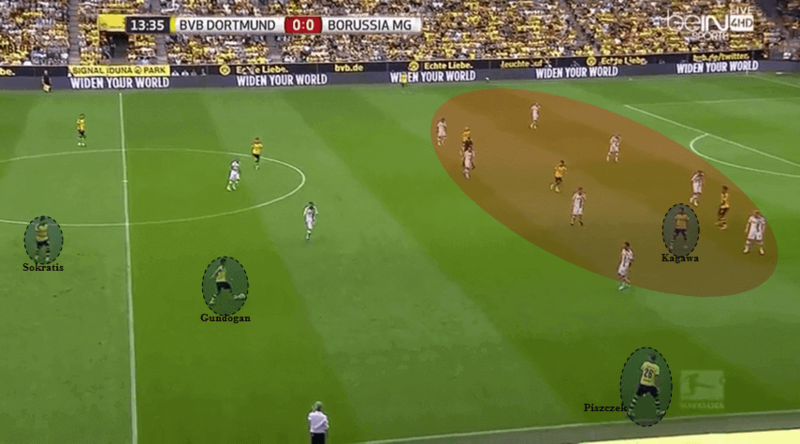 As the initial shape, both central defenders would move wide to distribute the ball, either to the flank or to any of the double 6, Julian Weigl and Ilkay Gundogan. If the foals pressed with two forward press, for example, one of Gundogan or Weigl dropped deep vacated the classic 6 positioning to create three chain and being numerically superior (3v2 for Dortmund). On the other hand, this three also increased the horizontal coverage across the back line, which also made it hard for the two forward to press intensely. The dash lines on Gundogan and Weigl are the indications that the double 6 alternately dropped deep, if necessary. In this double 6, who had a very good level of system understanding, their positioning was just simple, but gave positive impact on Dortmund’s save ball circulation. You can see it in the below picture. In order to ease the ball progression, any of the 6 (Gundogan in this situation) positioned himself between the opposition pressers, so if he received the pass from the back line, he had been in a good positioning to play all three line passing up field or lateral to the flank. If you notice the positioning of Shinji Kagawa, the Japanese play maker would occasionally be dropping deep to help in this first phase. By doing that, Kagawa potentially dragged the attention of the foals’ 6 which in turn ruined the stability of the defensive pocket (space between the middle and back line). This diamond also built the stability for both defense and ball circulation as well. Let’s say if the foals forwards managed to put proper pressure to the back line, this diamond allowed the easier wall-passing and helped them to switch the play which also meant they could build the attack from various area. It allowed Dortmund to always be able to spread effectively. During these early phases, the sixes played an important role in the ball circulation as they needed to keep the possession fluid but still meaningful. Playing as the 6, they made sure the stability of the defense and had to make sure the deep area was resistant enough if any pressure was received. One important thing to note is, the Foals played in a 4-4-2 extremely narrow, this later on gave more space on the flank for Dortmund to exploit. The picture below shows how narrow Dortmund’s formation, as they overloaded the central area. It was intended to (1) deal with this Favre’s centrally-compact 4-4-2 and (2) create more space on the flank which opened better chance for Dortmund to attack the half-space as well, especially when the horizontal-compactness between the near-ball winger and near-ball 6 was broken as they needed to focus to the space on the flank and the opposition’s central overload at once. Dortmund’s central overload plan. Six Dortmund players occupied around the central area. Take notice on the positioning of Lukas Piszczek and Marcel Schmelzer that was intended to ruin the horizontal compactness. 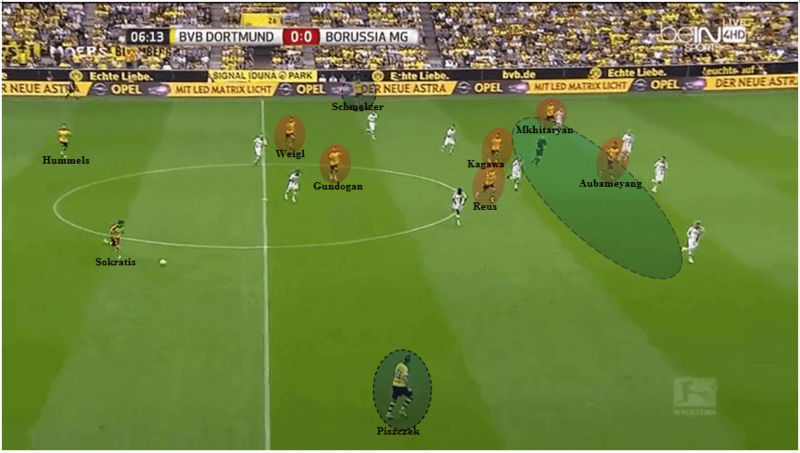 The green areas were the defensive pocket and flanks that Dortmund would later on be continuously trying to exploit. Regarding the stability of defense, the role of Dortmund’s central defender duo was important. First, they were used as the cover for the middle line and had to be ready for unexpected long ball as the consequent of their high defensive line pressing play. Second, they were also used as the primary creator when building (or rebuilding) out of the back. They were used in, primarily, in both 1st and 2nd phase of build up. This assignment was an appropriate approach, particularly against a deep-block like Tuchel’s team. With Dortmund played an extreme high d-line let alone the opposition were so deep, naturally, the central back line was one of the line with the biggest space to make use. In regards of this advantage, instructing the central defender duo to play as the ball spreader might be giving positive impact to ball circulation. The first example was the situation of 7th minute. A situation from 07:06” minute. An aggressive press by the Dortmund’s twin 6 (1) to the Foals’ 6 had opened huge space (green ellipsed area) behind the middle line. Fortunately, Raffael who received the ball and tried to play a quick one-touch missed it (2). The ball was recovered by Mats Hummels (3) who directly played it to Kagawa (4) then forwarded it to Henrikh Mkhitaryan (5) which resulted a wrong linesman decision as he ruled out the Armenian’s goal. The other interesting part of Dortmund’s 2nd phase of build up was their intentional play of creating a slow possession-football for a specific purpose. One of perfect example was the process to the first goal. 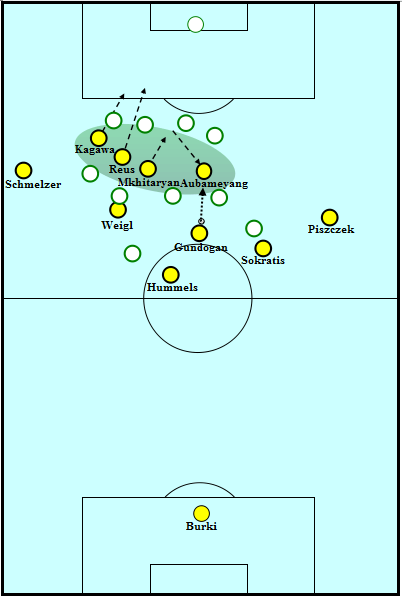 In this match against Monchengladbach, Dortmund focused to attack the right (Dortmund’s left) side of Monchengladbach’s defense. Interestingly, instead of constantly attacking it openly through the left side, Tuchel opted to combine his primary-plan with a psychological possession-play which intentionally to drag the opponent’s attention and focus to specific area before hitting them from the opposite side. The first goal process. The red area was the area where Dortmund’s frontest four engaged eight Monchengladbach players in order to keep the opponent’s defensive line stay deep (the purpose was to keep the opponent to stay back). This created a qualitative positional-superiority as the four held the Foals’s eight to stay deep which created the very huge space for Dortmund to circulate the ball in front of Monchengladbach’s middle line. The other common sight was the use of the 6 (here Gundogan was the 6 who carried the ball) to spread the ball and allowed the central defender to stay back as they were also used as switching play check-point if necessary. In the situation above, from 13:34 minute, started from Sokratis’ pass to Gundogan, untill 13:58, when the ball was switched to the left side to Hummels, Dortmund players made 25 touches and 8 passes (all completed) between Gundogan, Lukas Piszczek, Kagawa plus Sokratis Papastathopoulos, in a relatively slow speed and patient manner. It was a slow possession-play which appeared to be the decoy of dragging opponent’s attention and focus to specific area. At 13:46, right away after passing the ball back to Gundogan, Kagawa moved diagonally forward and left Gundogan “alone”, as Kagawa occupied the 10 in between Mkhitaryan and Reus. Kagawa moved diagonally forward and left Gundogan “alone”. Gundogan passed the ball back to Sokratis then to Hummels which finally resulted the first goal. Here the check-point was activated. The ball was circulated from Gundogan to Sokratis to Hummels (as the switching point). When Hummels made the forward pass to the desired area, both Reus and Kagawa occupied the defensive pocket, with Reus on the half space and Kagawa at 10. This created a triangle shape between Hummels-Kagawa-Reus allowing Reus to directly attack the channel between Jantschke and Schulz. As had been discussed earlier (see the 06:13 picture), Dortmund constantly tried to occupy this defensive pocket by using their frontest four. This first goal was also the right example of the combination from various tactic. We can see the role of the double 6 (one as the shield for the central defender and one as the cover for the ball circulation area). There was also the slow build-up on one side which psychologically was intended to drag the opponent’s concentration and focus to one specific area. The manner of Sokratis and Hummels shows the important element of switching play point and ball spreader. And, the last one, was the Dortmund’s defensive pocket (the 10 and half space) attack. On their 3rd phase of play (chance creation), there were generally at least two main variants that used by Dortmund. The first variant, was utilizing the wide area. The second goal of the match was the example of maximum effect of this tactic. The other interesting example, was the situation of 43:42 minute, when they overloaded the one side but tried to hit Monchengladbach from the opposite side. Wide area utilization on build up 3rd phase. Scene from 42:43 minute of the first half. The second variant was the use of false nine and false 10. On many situation of 3rd phase, Pierre Emerick Aubameyang was the one to act as the 9 nine with Marco Reus, Kagawa, or Mkhitaryan being the false 10. False 9 and false 10 combination. A pass to the Monchengladbach’s defensive pocket is picked up by Aubameyang. The other nearby player ahead of him take the position of vertical movement into the box. This was the part of Tuchel’s tactic in occupying the defensive pocket area. The choice of appointing Aubameyang to play such role was another ideal tactical plan, because the Gabonese was recognized as a 9, combining false 9 with false 10 might ruin the opponent’s defense as it might create some confusing defensive situation. Any perfect example for this combination? Ah yes, the moment of 65”. Is it that good? you can ask thomas tuchel why he made such face. Beside those two variants, there was one variant that would be applied depending on the attacking situation. A direct pass directly from deeper area to the forward line. Again, Aubameyang was the one of the player who acted as the pass-receiver. Because this variant was depending on the development of attacking situation, it could be the central deep area players to made such pass or on another occasions it was the wide man who did it. In Tuchel’s Dortmund defensive play, 4-2-3-1 was the orientation shape. From this basic shape, they developed it into 4-4-2/4-4-1-1’ish or 4-1-4-1/4-5-1 one. Zonal marking was the style as the part of their pressing positioning. Tuchel’s boys were trying to block all the available options, as the orientation was the passing options, but in some specific situation (opponent’s throw in, for example) Dortmund zonal marking play was more to a space-oriented approach. Option-oriented zonal-marking. As the opponent were moved to the Dortmund’s left side, seven Dortmund players shifted to the left and congested the area around the ball. The other two wide-men, Reus and Piszczek, focused to Monchengladbach’s wide-men to minimize the potential unexpected threat through the wide area. Here the example of Dortmund’s squeezed the space when defending against throw in. On their defensive play, Dortmund got two common way of play. The first one was the resting press, in which Dortmund deliberately created the space for the opponent’s central defender to work on. From here, we often see Dortmund’s transformed into something like a 4-4-1-1/4-4-2 basic shape, as Aubameyang and any of three attacking midfielder/AM (mainly Kagawa) formed a staggering forward-pressing shape (Aubameyang took higher position). By doing this, Dortmund were moving the opponent’s ball circulation to the deeper-forward space which lead the opponent to move the certain area. Touchline was the primary option for Sortmund to trap the opponent. It purposely to regain the possession or at least forced them square or back. Here is the rough initial press shape. The nearest to Aubameyang central AM, made a half-press, as he press less intense than Aubameyang did. His pressing triggered by the ball-carrier central defender manner who was being pressed by Aubameyang. Had it the ball horizontally-played to the other central defender ot to the dropping-deep 6, the full-press would be activated. The 2nd wave of pressing was made by any of dortmund’s wide-men whose the press oriented to the opponent’s full backs. The staggering 6 was the initial-indication of another transformation, if necessary, should the press be bypassed by Monchengladbach. Julien Weigl would be the deepest midfielder meant the basic shape transformed to 4-1-4-1’ish. Moved the opponent’s players to the left side. As discussed earlier, another staggering shape was found in the frontest-two pressing shape which intentionally to move the opponent to certain area to be later be trapped. In this phase of play, the near-ball forward and winger kept their pressing positioning slightly away from the ball carrier or from the area of where the ball was circulated instead of intensely-pressing them. This was meant to invite the circulation to the earlier-mentioned-certain-area. 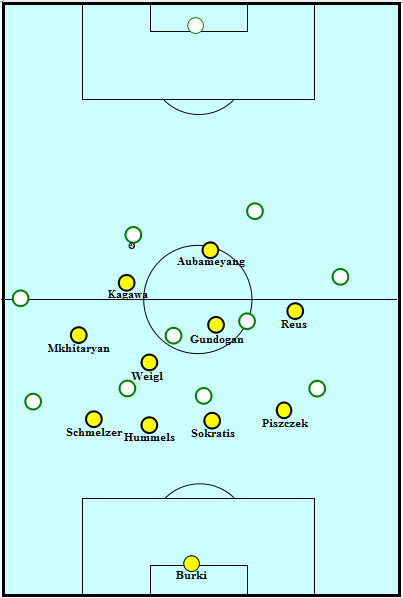 In the shape as shown on the above diagram, this Dortmund’s block lead Monchengladbach to the left, moved into the desired area where Dortmund wanted to trap and regain possession. But, in fact, there was another possible situation (another trap) had Monchengladbach’s ball carrying central defender passed it to the central area. Those two situation can be seen below. Actually, Dortmund failed to maximize their touchline pressing trap. It was an individual mistake that reduced the impact, not the system. The point of the diagram, is to show the way Dortmund played their attack-press to lead the opponent’s ball circulation to certain desired area. The positive impact of this pressing play, despite they failed to maximize it, was Dortmund managed to force Monchengladbach to play the ball back which meant there was no progression made by the opponent. 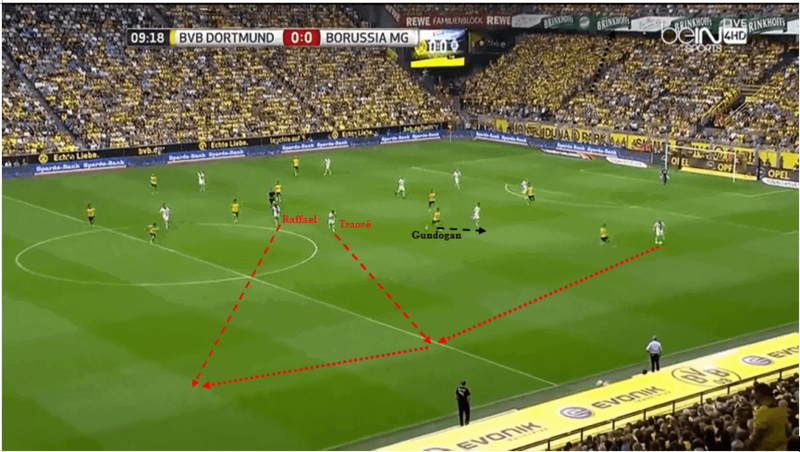 Narrow shape was the crucial factor of Dortmund’s compact formation. In certainly helped Dortmund to counter press Monchengladbach when they lost the possession. But not only in an open play Dortmund played narrowly, in the throw in situation Tuchel’s boys also managed to build an extremely compact shape as they both horizontally-vertically compact. With the final score line 4-0 for Dortmund let alone by their aggressive attacking play, Tuchel’s Dortmund looked to be a perfect side. A team which capable of chasing title. Is it true? To some extent, based on this one match, yes. They played the system (nearly) perfect. 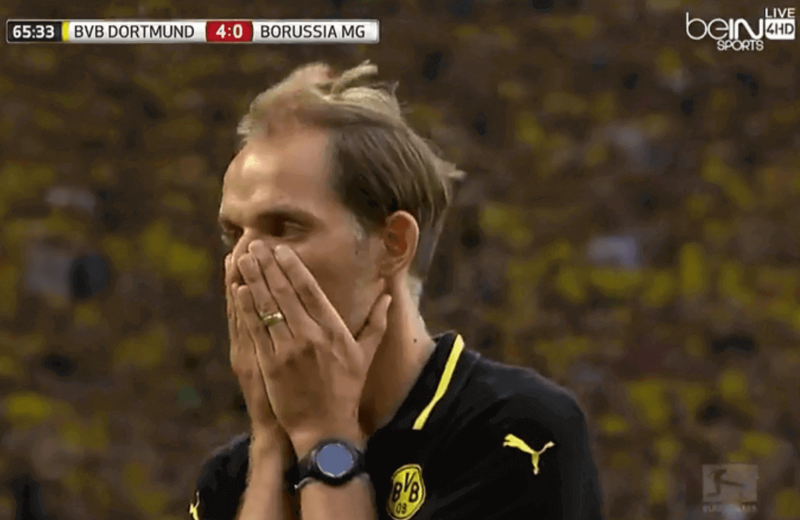 But, there were actually things to pay attention for Tuchel. The simple elements that might cost them had it no improvement. The first issue, was their main pressing wave that severally got no adequate cover, which lead to the huge space created and potentially being exploited against the better-performance opponent. Vulnerable space at 6, as the central midfielders press got no adequate cover behind it. Here Monchengladbach failed to make use f it as Raffael (marked by #2) missed his pass. Another uncoordinated pressing-positioning. Andres Christensen realised there was space behind Piszczek, fortunately for Dortmund, the central defender had that pass too weak caused it be intercepted by Piszczek. Vulnerable space in the central area, as Dortmund failed to block the central passing lane. 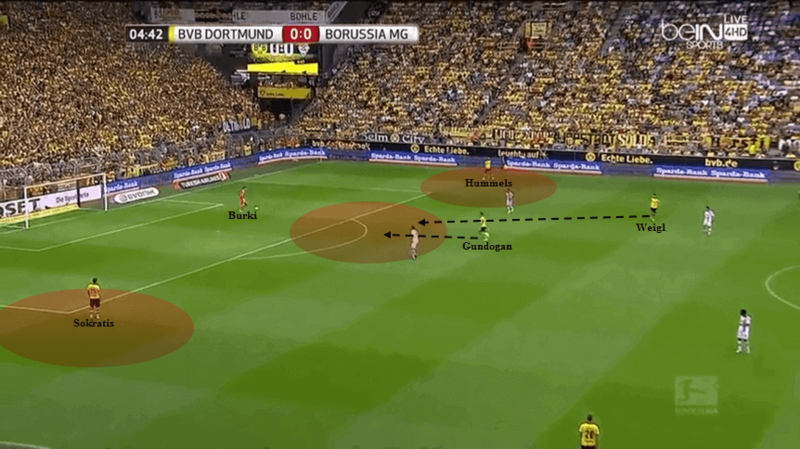 The dash arrows on Weigl, Hummels, and Sokratis are the indications of their direction focus. Particularly Hummels and Weigl, it seems they focused more to the left because they thought Schulz would pass the ball to the left flank. 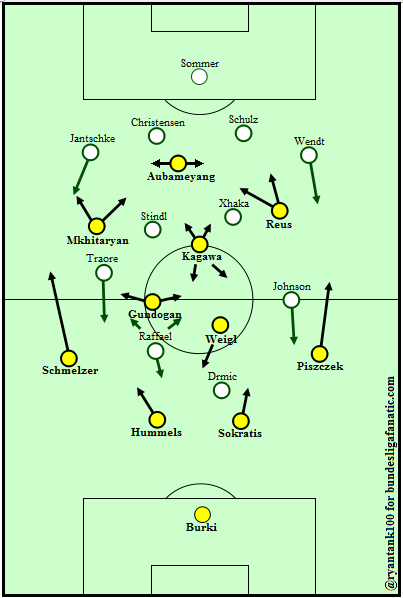 So, when Schulz passed it Xhaka (in the central area), there was no adequate pressure which in turn lead to a progression, as the ball was played to Raffael who was being man-marked by Sokratis. Vulnerable space on the flank as the consequence of the extremely space-oriented zonal marking. Dortmund might improve their defense in this situation had (1) the left touchline press could perform better so Monchengladbach players could find no way through, (2) Gundogan didn’t orientate to Johnson, but to the space around the area of Traoré’s diagonal run. The pressing trap from 16 : 48 minute was also the other example where Tuchel needs to pay more attention on. It was an individual factor that failed Dortmund to maximize the trap. There were several another identical examples like those first three pictures. Thomas Tuchel needs to pay more attention on and improve it. Modern football demands crazy-level of focus and compact shape of defensive play. A very simple mistake will ruin the playing process which means the momentum was gone. On the other hand, Dortmund also seem to be weak at corner-kick, as they don’t have many good aerial-duel players. Tuchel also needs to see this part deeper as it might harm them when defending against set-piece. It’s too early to judge it, as Dortmund just played their first match, but the potential weakness remains there. Next several matches will justify it. This Tuchel’s Dortmund seem to be convincing of playing for the title. But there should be no room for complacency for sure, especially there will be still many matches to be played. On the other hand, with some intensity in their play, Tuchel needs to make sure the fitness area is handled properly. History tells it. During the darkest hours of last season, injuries and fitness issues were a problem for Jurgen Klopp. And those issues played a huge role in ruining Dortmund’s 2014/2015 campaign. This entry was posted in tactic and tagged Ball circulation, Borussia Dortmund, Defensive play, Monchengladbach, Pressing trap, Thomas Tuchel. Bookmark the permalink.